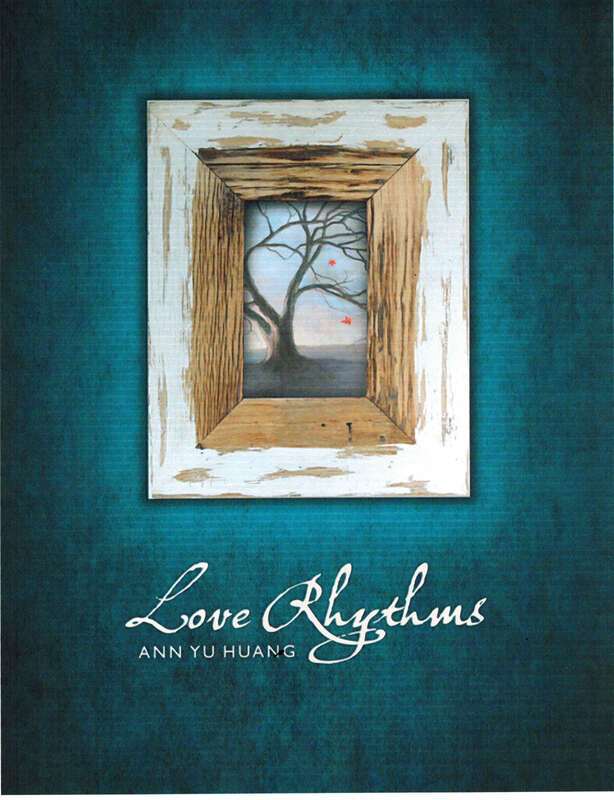 In celebration of National Poetry Month, Ann Yu Huang announces the release of “Love Rhythms,” a collection inspired by what Huang calls “a long incline through life.” The collection will be featured at the 18th Annual Los Angeles Times Festival of Books at USC April 20-21. I crashed into the sun this afternoon as / I drove down Pacific Coast Highway./ It was a pink-red tomato-dyed/ plate on a pale white sheet and / looked asleep,/ dazed inside smoky silver clouds. 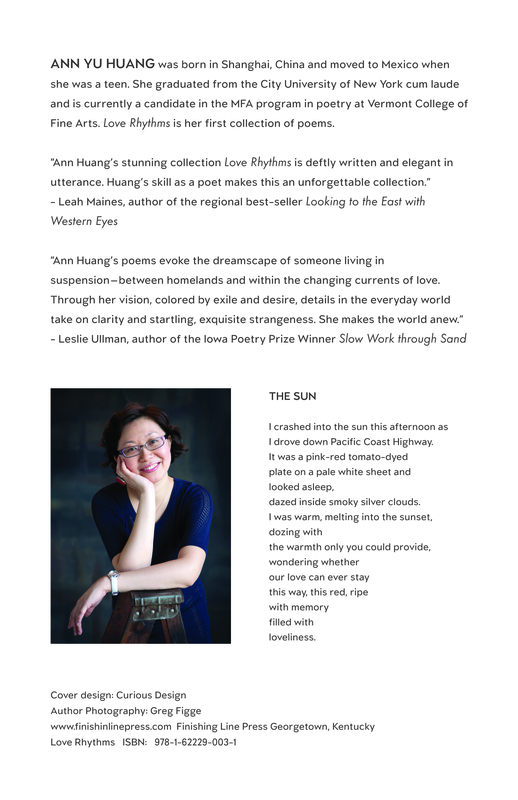 Ann Yu Huang’s collection of poems, “Love Rhythms,” will be featured at the 18th Annual Los Angeles Times Festival of Books at USC April 20-21. The collection was written to satisfy an “insatiable desire to recover lost time, as well as the excitement and freshness of approaching something through writing,” said the author. 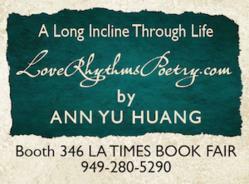 Huang is excited to feature ‘Love Rhythms’ at the 18th Annual Los Angeles Times Festival of Books at USC April 20-21. Ann Yu Huang was born in Shanghai, lived in Mexico as a teenager and went to college in New York City before coming to Southern California. Her poems stretch to inhabit varied geographies and centuries while at the same time sticking close to home. Besides love, Huang expresses loneliness, loss and wonder in her rhythmic lines. 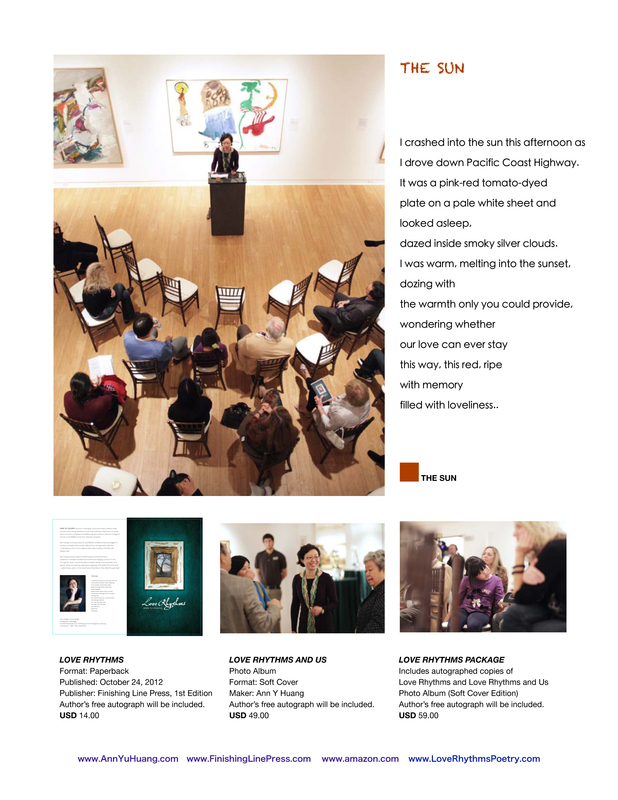 Finishing Line Press is a poetry publisher dedicated to providing a place for today’s poets since 1998. The company is based in Cincinnati, Ohio and Georgetown, Kentucky. In addition to the Poetry Chapbook Series, it publishes the New Women’s Voices Series and sponsors the Finishing Line Press Open Chapbook Competition. Finishing Line Press and editor Leah Maines were featured in both the 2001 and 2002 Poet’s Markets. 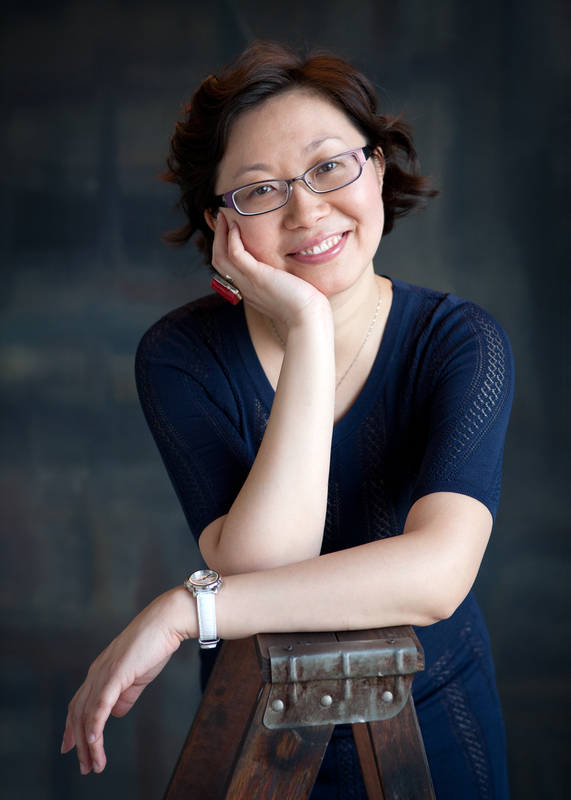 Ms. Huang is the recipient of 2014 MFA of Vermont College of Fine Arts in both Poetry and Translation concentration in Poetry. She currently holds the position of Vice President, Marketing from Nature Bright Company, a ‘green’ home-healthcare brand that specializes in developing therapeutic lighting products to help people’s mood and cognition.